Marciello also won at Hockenheim. © F3 Euro Series. In person, Raffaele Marciello – last weekend’s victor of the 73rd Grand Prix de Pau – doesn’t quite come across as the most outwardly confident person that has crossed my path. Hanging medium-high in pitch, while soft in texture, the low volume of his voice is not quite sheltered and at no stage do his words descend into a muted rumble; however they don’t necessarily punctuate either. That’s not to say Marciello is short on confidence – the Swiss-Italian racer possesses that in abundance – rather the Prema Powerteam racer rarely appeared to acknowledge the pressures that surrounded. All that is missing is the all-encompassing exuberance, yet when Marciello does speak, his words are rarely stifled – they are purposeful and touched by intent. Pau was a natural example of that intent. Beyond Friday’s irrepressible 35°C heat, Prema Powerteam collected themselves well despite several minor incidents, all the while knowing Carlin and Fortec were the constant threats – indeed, Carlin’s Jazeman Jaafar appeared far more settled than ever after he led the way on Friday. The heat switched to cooler climes on Saturday, before settling for a healthy mix of both conditions come Sunday and it was here that Marciello made his efforts count. In the car, the Zurich-born pilot noted the state of his Cooper Tyres – the rears especially – while still pushing them hard. Each tour saw the gap to his followers steadily increase, until his Cooper rubber plateaued late on in the event. Cool, calm and utterly confident – he merely let his Dallara F312 do the hard work for him. Steely aggression certainly played its part in Marciello’s eventual victory, but it would not have been possible had that fiery drive not been ring fenced by a tentative subtlety behind the wheel. While others in the pack were fighting not just for position, but also for control, Marciello made it seem easy. The Grand Prix de Pau did not rank as Marciello’s first win of the season*, but it may be thought of as one of his finest. He made his car dance and that was quite sublime to watch. Upon reading this performance, this latest Ferrari Formula 1 protégé may be no shrinking violet. It does, however, remain to be seen if Marciello can turn this success into a consistent run – but he is young** and he still has so much to learn. Marciello claimed the top spot in race two of the F3 Euro Series round of the Hockenheimring last month, although a poor final race leaves him lingering 5th in the championship with 20 points. He currently chases Daniel Juncadella (Prema Powerteam, 50 points), Carlos Sainz Jr (Carlin, 41 pts), Felix Rosenqvist (Mücke Motorsport, 38 pts) and William Buller (Carlin, 28 pts). There was also a race win at Hampton Downs during the brief Toyota Racing Series campaign in the Australasian region, although Marciello ended the championship in a disappointing 9th spot. 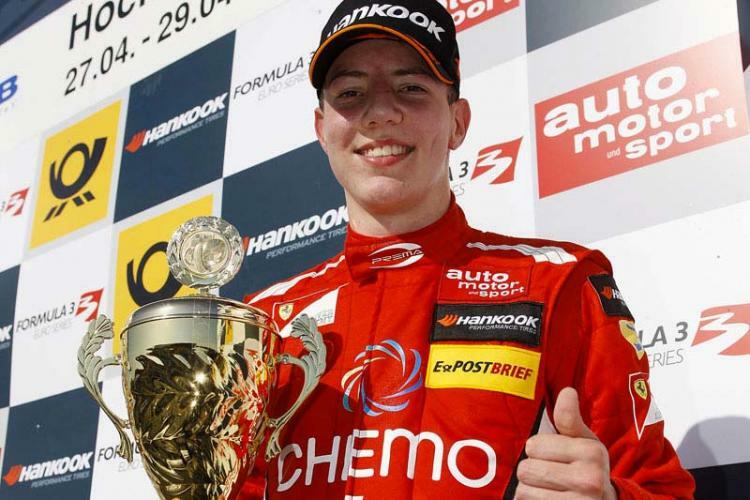 Marciello only turned 17-years-old just before Christmas of last year. As a measure of his inexperience, this season represents only his third year as a car-racing driver. I don’t know what your sources are, but: I was under the impression it was the 71st Grand Prix de Pau; and the Toyota Racing Series is (and has only ever been) based in its entirety in New Zealand, not spread over “the Australasian region”. Regarding the Grand Prix de Pau, it really depends who you listen to really. There have been 73 Grand Prix in Pau, but 71 Pau Grand Prix, if that makes sense. I received releases that stated both. As for the Toyota Racing Series, apologies – that was an error on my part.